Service Provided: Handmade Jewellery, Sydney & Jewellery making classes. Are you looking for a unique activity to do, or are you interested in a one of a kind piece of jewellery? Tass & Pom is the place for you. They offer handmade jewellery in Sydney as well as jewellery making classes. All of their products are designed, created and sold in Australia, and they help others learn the craft as well. Jess is a local creative with a passion for creating and colour! Her handmade jewellery will add a splash of colour to your life! Follow Jess on Facebook and Instagram to see all of her amazing creations and to see more of her product range simply click Shop Now to be taken to her online store. Discover the wonderful craft of polymer clay jewellery making. 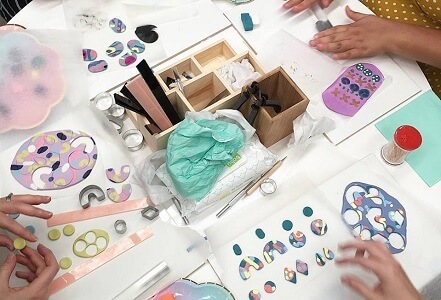 Attend a jewellery making course in Sydney and learn the basics of working with polymer clay. Or, if you want to host a get-together, Tass & Pom offers popup workshops. These workshops are great activities for hen parties, birthdays and kitchen teas. Explore your creativity and have fun. That’s what crafting is all about. Learn something new and walk away with handmade jewellery that you were able to create yourself. Tass & Poms handmade jewellery in Sydney is unique, just like the people that wear it. Each piece is handcrafted and designed with care. They design every piece so that the wearer looks and feels their best. Make a statement with a pair of unique earrings. They are the perfect accessory for day or evening and can work with t-shirts and jeans as well as a dress. They are the must-have accessory for Spring/Summer 2019. Add a splash of colour by wearing a pair of handmade mini studs. They are subtle and simple and perfect for those who want to add a little touch of elegance to their style. They can be paired with a little black dress or a simple pullover. These studs are larger versions of the mini studs. They are a little more dramatic and will have heads turning. They are statement pieces that will not weigh you down. Tass & Pom offers simple necklaces styles as well as bold pieces. No matter if you want a necklace that you can wear every day or one that is going to make you stand out, they have something for you. After giving birth to her second child, Jessica felt that she needed to be doing something creative. She stumbled across polymer clay and began experimenting with the craft. She fell in love with the whole creative process, to the point she started Tass & Pom. Now you too can own a piece of her handmade jewellery. You can be wildly creative with the polymer clay medium, and Jessica wants you to love the pieces that she has to offer. If you want to learn how to work with the clay and become more creative yourself check out a Tass & Pom workshop. You can find Tass & Pom online at tassandpom.com. 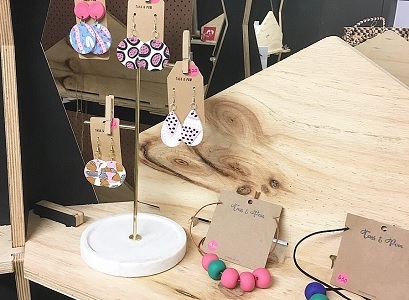 Shop online, attend one of the jewellery workshops or have a pop-up jewellery making party so you can also learn to make handmade Jewellery in Sydney.